Cooking can generate all kinds of smells – some delicious, some not so delicious. However, one thing is constant. When your delicious beef bourgignon or sausage casserole has been consumed, the last thing you want is its scent to linger. And that’s where our trusty friend the cooker hood comes in. Now a staple in the majority of kitchens, the units are usually a sleek stainless steel or more rustic shade, depending on what you’re going for. There’s a hob-facing cooker hood lamp in them too – handy, functional, and good lookin’. 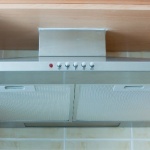 A decent hood can extract all kinds of odours and get them out of your kitchen and with multiple speeds and settings they are very often capable of doing this quickly and efficiently. One area where they are particularly useful is in small flats or homes where the kitchen backs on to the living area – after all who wants to sit in front of the TV with the smell of last night’s curry in the air. However, when the the odours appear to be going nowhere and smells seem to linger even when the hood is cranked up to its highest setting, the time may have come to replace the filter on the unit. We stock hundreds of cooker hood filters. You can get universal filters, which can be cut to size to fit your hood, and you can get genuine replacements, which are manufactured to specifically fit your model. It’s always recommended that you get the genuine replacement, if there is one for your model. They’re generally a little more expensive than the universal filters, but the fact that they’re made specifically for your hood means they’ll generally do a better job of filtering the smells and grease effectively.